Seen Janhvi Kapoor and Ishaan Khatter's picture with Roohi and Yash yet? 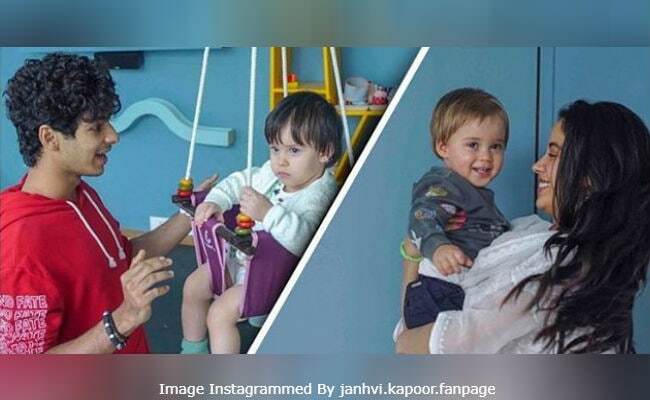 Have you seen the cute picture of Janhvi Kapoor and Ishaan Khatter with Karan Johar's twins Roohi and Yash yet? Dhadak stars Janhvi and Ishaan were reportedly visited by Roohi and Yash during the film's promotions. The adorable picture, a collage precisely, features Yash cradled in Janhvi's arms while Roohi enjoys her ride and Ishaan stands opposite her. The adorable picture has been shared widely on social media by Janhvi's fan clubs. Yash sports a big smile on his face while Roohi appears to be a bit bewildered. (Aww). Hard to miss Janhvi's smile and Ishaan's expression too. Here's the picture. Karan Johar is the producer of Dhadak, which is Janhvi Kapoor's debut Bollywood film. Dhadak, which is just a few weeks away from its release, is the remake of Marathi film Sairat. Janhvi and Ishaan are currently busy promoting their film in different cities. Dhadak traces the love story of Parthavi (Janhvi) and Madhur (Ishaan) and the challenges they face in the course of time. At the trailer launch of Dhadak, Janhvi said that her she wanted to do a film like Sairat and she had discussed about it with her mom Sridevi too. "I saw Sairat with mom at home and I remember telling her 'I wish that this was my first film and I could do something like it'. Me and mom had this big discussion on how she wanted a role like this for me and then you (Karan Johar) called and it happened," Janhvi said, news agency PTI reported.